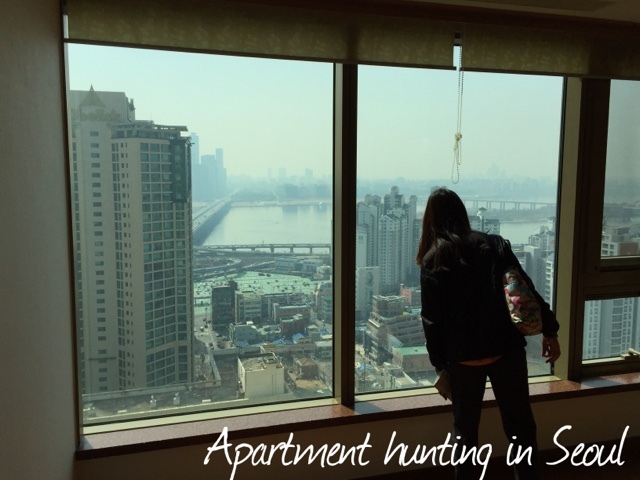 This was our second apartment hunting in Korea. This experience is over a year old - but I thought I'd share this finally. Let's just say I hate don't particularly enjoy the process. I am not one to enjoy shopping and choosing between unlimited options. I even despise shopping for necessities like grocery. Maybe I've been spoiled - because shopping takes too much time and effort when I can just rely on experts to pick the best apples and eggs through an app. Gosh I love Korea, emart, and technology for this. 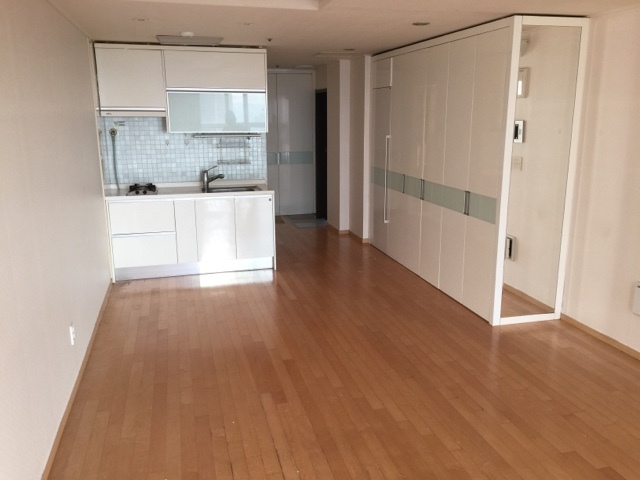 First of all, apartment hunting in Korea is like a game of get it or it will be gone tomorrow. The truth is that half of it is true. Things go fast here, especially if it's a good apartment. But you gotta trust instincts. We set our eyes on this apartment complex because I don't know why - it just had everything - a Paris baguette downstairs, connected to the subway, and a 24 hours kimbap place. Sometimes we go all out on a plan, but one month before having to move out, we decided the hell with it and look at what looks good. We picked a random realtor from the building and luckily she was diligent enough to show us 10+ apartments without appointment. We saw some places with great views of Han river. To the cozy studio apartments. The apartments ranged from mini to large spaces. I liked that arrangement. No one can feel superior or less because everyone shared the same building. 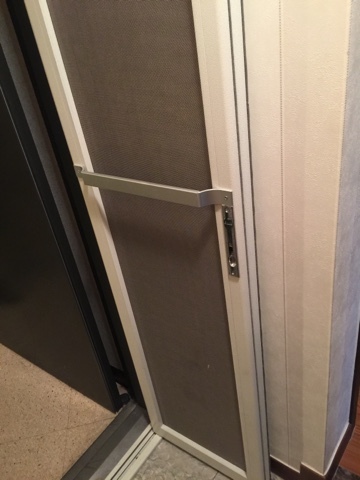 Most things in the apartments were pretty sturdy. Make sure you check and ask and look into every cabinets, etc. Don't be shy to ask to fix things or what they can do or provide. Ask ask ask. One of the last apartment caught my eyes and vibes. 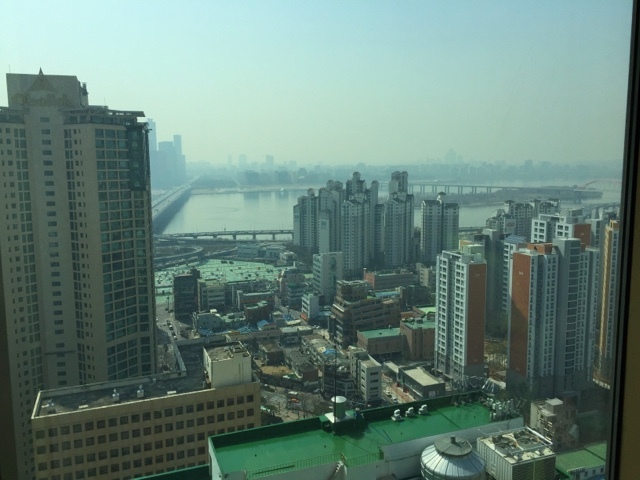 It had a great view as well overlooking the Han river, mountains, and 63 building. The interior was the best one out of all the other ones - with stone walls and pretty wallpapers. Checking this and that. We negotiated the apartment in one day. Maybe it's just me - but I like things done fast and to get things over with - so far it's worked ok for us. 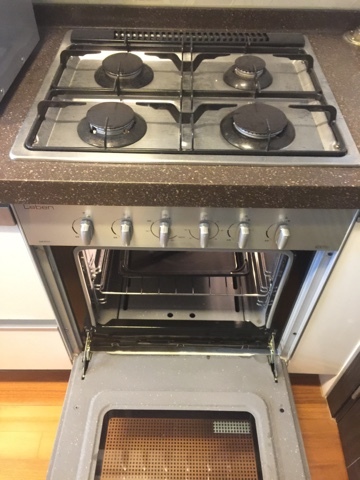 Sometimes planning too much has hindered things. Go out with good energy and just do it. I'm so glad we decided on this apartment. It was love at first sight for me - I had a good feeling about it. Much to our surprise, the landlord is a younger couple in their 40s who actually lives in our previous(then) apartment. The irony. They also spoke good English! Being able to communicate with your landlord is a big plus. Sometimes things just fall into place. This was one of them. That's pretty much all we did to get our apartment. Get lucky and kind of know what you like. Be positive and trust your instincts. Although we were intending to get a smaller modest one, we ended getting a bigger place with higher rent. My husband set an appointment to sign the contract and seal the deal. The key deposit is huge by comparison to US rents. But you do get it all back - but always take caution - check the owners and realtors IDs, credentials, etc. We pay a good amount of rent monthly for this place but no regrets. 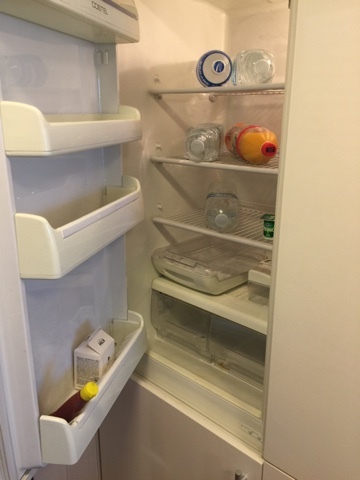 Since we are homebody people, we have been enjoying our apartment much more than before thanks to the view and comfortable location - we are connected to the subway station and because of it save more on transportation costs and time for traveling. My husband also has stopped taking taxis thanks to being connected right in the subway station. I think it's important to know what you prioritize first. Some would definitely disapprove renting such place for comfort - but it's important to us to be safe, comfortable and close to a subway. Don't be fooled by realtors telling you it's so and so minutes away from subway - do the walk and imagine doing that rain or shine or snow. 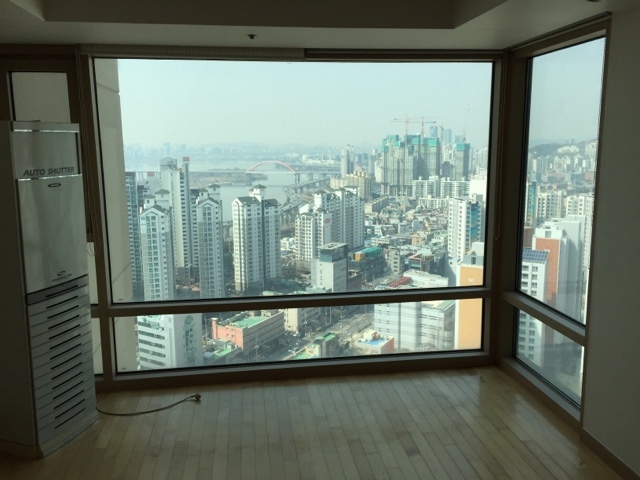 Those are some of the factors you have to take into account when apartment hunting in Korea. The realtor fees are huge - so be aware of that too. Make sure to ask how much it costs for the apartment monthly fees (gwal-li-bi) - they all differ per apartment. This payment is also not small - about a couple 100,000won and more easily depending on how big the size and what they charge with it - water, security, electricity, etc. Also, as a tip, the newer apartments tend to have thinner walls thanks to eased restrictions on construction. That means that you will hear your neighbors walk or pee depending on how its constructed and when. The older apartments have thicker walls. Our "new" apartment previously that we lived for 4 years was just horrible - we could hear peeing, yelling, and love making. 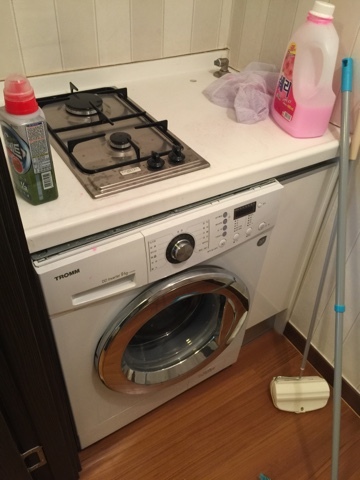 And mind you it was a "Samsung" apartment. Name brands do not mean anything. Be warned. Even if it looks old outside, I would trust an older solid apartment over a fancy newer brand named one. officetel and apartments are different in that an officetel can be used for business - I think that's the main difference. Wolse: is monthly rent with some down payment. Jeonse: is a lump sum of down payment That you get back after contract - no monthly rent. But this payment is huge huge huge! 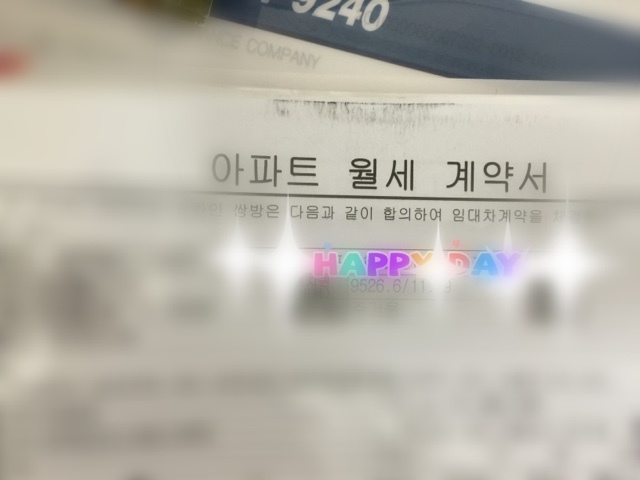 Foreigners are restricted from getting a loan for jeonse. Lately, more landlords are actually preferring monthly rent over this lump sum down payment. Or the combination of the two.